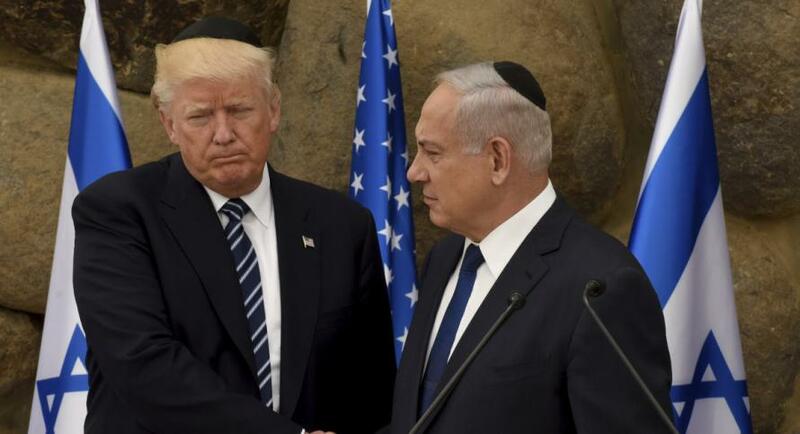 Trump To Present Mideast Peace Plan "With Or Without The Palestinians"
A 'post hoc' attempt to present the US as a sincere broker in the peace process? Axios reports that amidst the current complete disconnect in relations between the White House and the Palestinian Authority there is serious consideration underway of moving forward with President Trump's Middle East peace plan with or without the Palestinians at the negotiating table. "Since it's not done, we haven’t decided yet how we are going to put it forward and what happens if one of the sides isn't ready to come to the table. We are not there yet. But we are very optimistic that all relevant countries who want to support a peace agreement between the two sides are still waiting for our plan, want to work with us and realize we cannot be replaced. Despite all of the false reports about our plan, we are confident it will be beneficial to both sides and both peoples." As recently as a week ago Trump repeated his threat of cutting US aid to the Palestinian territories, telling reporters at the World Economic Forum in Davos that he could cut $700 million in annual U.S. aid "unless they sit down and negotiate peace." Trump has frequently visited the subject following the fierce international reaction to the early December move which gave formal US recognition of Jerusalem as the capital of Israel, which includes plans to relocate the US embassy from Tel Aviv to Jerusalem by the end of 2019. At Davos, just before a planned meeting held on the sidelines of the economic summit with Israel's prime minister, Trump heightened his rhetoric, saying of the Palestinian side represented by Mahmoud Abbas, "They're going to have to want to make peace, or we're going to have nothing to do with them any longer." Trump added further, "We give them tremendous amounts, hundreds of millions of dollars. That money is on the table, because why should we do that as a country if they're doing nothing for us?" And concluded by saying he simply wants "peace" and "to save lives": "And what we want to do is help them. We want to create peace and save lives. And we'll see what happens. We'll see what happens. But the money is on the table." The December 6th announcement unleashed a wave of protest among Palestinians in the West Bank, Gaza, and Jerusalem which resulted in multiple deaths during clashes with Israel security forces. Dozens of rockets were also launched out of Gaza, with Hamas leadership calling for a new 'intifada' - or mass uprising against Israeli occupation - soon after Trump's announcement. In addition, Vice President Mike Pence was twice forced to push back plans to visit Jerusalem and the West Bank town of Bethlehem, the latter which was canceled altogether as Palestinian officials declared their intent to snub the vice president during this visit. Pence finally made the trip less than two weeks ago but failed to meet with Palestinian leadership, and gave a speech before Israel's Knesset wherein he reaffirmed Trump's commitment taking the next steps necessary to making the US recognition of Jerusalem a reality on the ground, saying "In the weeks ahead, our administration will advance its plan to open the United States Embassy in Jerusalem, and that United States Embassy will open before the end of next year ." He further said, "Our president made his decision in the best interest of the United States,” and added, "The United States has chosen fact over fiction" while peppering his speech heavily with Old Testament references throughout while pledging to "stand with Israel because we believe in right over wrong, in good over evil, and in liberty over tyranny." Palestinian officials have claimed that the US under Trump has fully abandoned its role as an "honest broker" - however its unlikely that the Palestinians ever genuinely perceived the Americans in that role to begin with, as US aid to Israel - the bulk of it in the form of military support - has for years been in the billions per year. In 2016 the US signed off on a record $38 billion military aid package to Israel over the next decade. Abbas recently summarized the Palestinian Authority's reaction to the Jerusalem move by slamming the decision as the "slap of the century" . "If Jerusalem is off the table, then America is off the table as well," President Mahmoud Abbas' official spokesman Nabil Abu Rudeineh said in a phone call with CNN, reiterating that Palestinians no longer recognize the US as a mediator in any peace negotiations with Israel. Per the Axios report, should the White House move ahead to present a Trump peace plan before the international community it will likely be a mere post hoc attempt to present Trump as a sincere broker in the peace process. A December 21 United Nations vote to condemn the US Jerusalem recognition was dubbed a "stunning rebuke" of the US President's decision after 128 countries voted against the US and Israel, and with 35 abstaining. While Palestinian officials saw the move as a final nail in the coffin concerning the peace process, Trump ironically presented it as "the beginning of a new approach to conflict between Israel and Palestinians." He said during the December 6 speech rolling out of the plan, "This is a long overdue step to advance the peace process and work towards a lasting agreement." Trump generally framed the decision as a way to put his own stamp on one of history’s oldest conflicts. "The record is in: after more than two decades of waivers, we are no closer to a lasting peace agreement between Israel and the Palestinians," the president said at the time. "It would be folly to assume that repeating the exact same formula would now produce a different or better result." According to Axios' report today, "Israeli Prime Minister Netanyahu said he will react to the Trump plan after he sees it but stressed he is ready to renew peace talks." No doubt, the Israelis now see the US as firmly in their corner after the Jerusalem recognition, in line with the long-running Jewish claim on the contested capital. In his speech during the plenary meeting, Greenblatt referred to Hamdallah and said he hopes that the fact he is participating shows the Palestinians are still committed to the efforts to renew the peace process. Greenblatt also said President Trump's announcement was just a recognition of reality and the connection of Israel and the Jewish people to Jerusalem. Greenblatt also said in his speech: "Did the President’s decision prejudge any final status issues? No. We have not taken a position on borders". Greenblatt stressed that the Trump administration continues drafting its peace plan and called on the Palestinians to return to the peace talks: "Peace will not be achieved by walking away from negotiations. It is easy to walk away from the table. But that helps no one, and it reduces or perhaps eliminates the chances of achieving a comprehensive peace agreement. And that would be terrible for the Palestinian people".